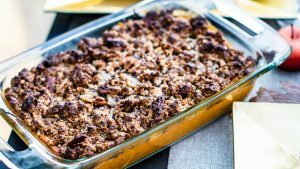 Sweet Potatoes are one of my husbands’ favorite foods, but the ‘typical’ sweet potato casserole is packed with sugar that you can’t even enjoy the real flavor of the sweet potato. I came up with this dish to satisfy our sweet potato casserole craving without a guilty conscience. The great thing about this dish is it conforms to SO MANY dietary issues, so it is perfect to make for those who have those struggles! Dairy Free, Gluten Free, and processed sugar-free! You can even adjust the crumble topping ingredients so that it is nut free! 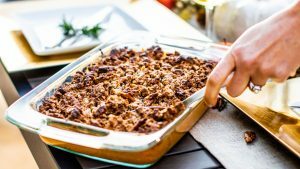 With this recipe, you can do a lot of the prep and assembly a day or two in advance, making this a perfect dish for the holidays because you can prep it and then just do the final baking step on the day of! 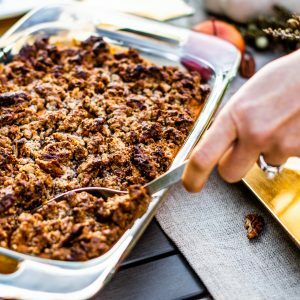 I am all about easing my cooking to-dos on the day of the dinner, you could even freeze the filling, freeze the crumble topping and then assemble when you are ready to bake! So toss those mini marshmallows to the side this year and make a sweet potato casserole that everyone can enjoy! 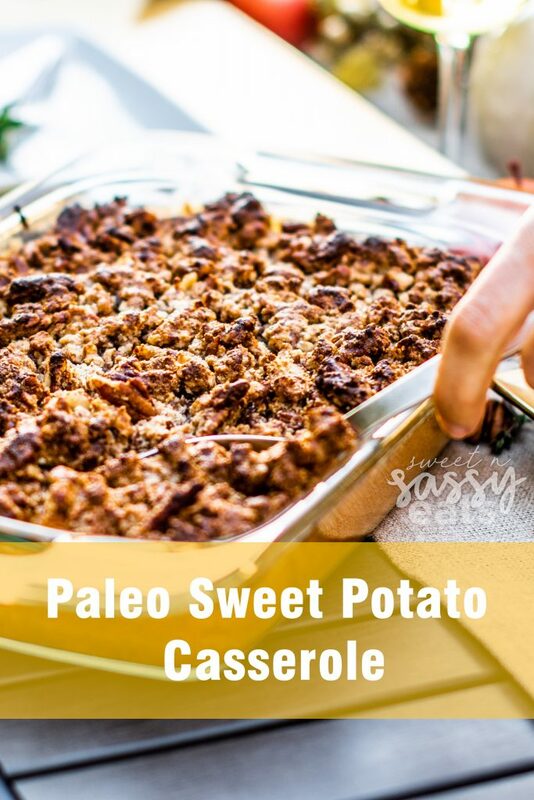 A delicious healthy twist on the classic Sweet Potato Casserole. A yummy almond pecan crust over perfectly roasted sweet potatoes and coconut milk. Preheat oven to 425º. Line baking sheet with foil. Place washed sweet potatoes on foil (skin still on). Bake until tender (typically 40-50 min). Once tender, turn off oven and allow potatoes to cool down in the oven. Remove potatoes from oven and remove skin, put potatoes in the bowl. Add eggs, coconut milk, 1/4 cup of honey, 1/2 cup of Ghee, Sea Salt, Cinnamon & Nutmeg. Blend until mixed well and smooth. Put in 11 X 7 casserole dish. In a separate bowl mix remaining ingredients to make the crumble topping. Sprinkle evenly over top the sweet potato mixture. Bake in the oven at 350º for 20 minutes or until golden on top. Let rest for a few minutes before serving.